The long wait is almost over, Apple/iPhone 5 fanboys. 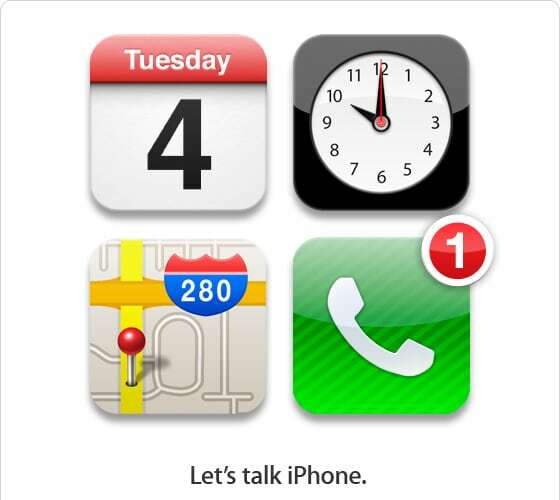 Apple has finally confirmed the rumored event to be held on October 4th for the iPhone 5 announcement. The confirmation of the event comes from The Loop who were invited to the event by Apple. According to the invitation received by The Loop, the event will take place on Apple’s Cupertino, Calif. campus on October 4th and will begin at 10:00 am PT. As you can see from the invitation, Apple calls this event “Let’s talk iPhone” on the calendar, clock, map and phone iOS icons. This event is expected to be the introduction of a new Apple iPhone 4S, a slight upgraded version of the iPhone 4 with a small changed in the designed. It is also rumored that Apple will introduce a 3G model of the iPod touch. Both new devices being introduced by new Apple CEO Tim Cook for the first time.